It took her two years to track down the Zaouli dancer, and it was worth it. M.I.A. is nothing if not global. Her aesthetic and lived experiences form an expansive cut-and-paste style through which she makes necessary, if occasionally vague, commentary that spans different geographies and cultures. Her latest video is "Matahdatah Scroll 01 Broader Than a Border," a two-in-one affair soundtracked by the new song "Swords" and 2013's "Warriors." With it, she eats up the distance between India and the Ivory Coast, where she shot the two parts of the short film, respectively. 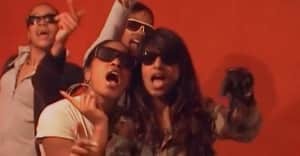 When she first tweeted about the "Warriors" visuals this spring, the British-Sri Lankan artist claimed her label had concerns about its context. "I wanna talk about clutrural [sic] appropriation! I've been told I can't put out a video because it's shot in Africa," she wrote of the video, which was due to be a one-take shot of an Ivorian dancer that it took her two years to find. In the end, she wound up splicing the footage of the nimble, loose-limbed dancer with scenes from both Côte d'Ivoire and India. "'Warriors' was shot in Cote d’Ivoire with a guy I saw in a YouTube video doing the most incredible dancing," she said of the dancer in a statement released alongside the video. "I tracked down that exact guy, flew out there and played him the 'Warriors' track. He did his thing for me. He is a spiritual warrior and communicates through dancing. It’s a lifelong commitment for him to be the designated spiritual body that channels that dance." The dancer in question is an unnamed member of a Zaouli troupe from central-western Ivory Coast, likely from the towns of Bouaflé or Manfla. Here's how Kouakou David, a West African dance teacher, explains the tradition: "Zaouli is a popular mask dance created by Gouros in the ’50s. Legends at the origin of the Zaouli mask and dance are diverse, but all say that they were inspired by a very beautiful girl named 'Djela Lou Zaouli,' daugther of Zaouli. The mask has bright colors and fine features, and represents feminine beauty." He adds: "Each Gouro village has its local Zaouli dancer, who performs during funerals or parties. A musicians and singers orchestra first call the Zaouli dancer by its music. The dancer wearing the mask covered by a cloth then arrives after a predecessor who unveils the mask. After the beauty of the mask has been shown to the audience, the dancer performs extremely quick and rhythmical steps according to the flutes of the orchestra. Hands and foots follow a common choreography improvised by the dancer according to the music." Though dancers typically wear elaborate masks while they're performing, the Zaouli in "Warriors" appears in a pair of sunglasses and an iridescent, fringed costume. Watch some spellbinding Zaouli moves above, and M.I.A. 's video via Apple Music.